There is greatness and then there is excess. This borderlines on the mixture of the two. 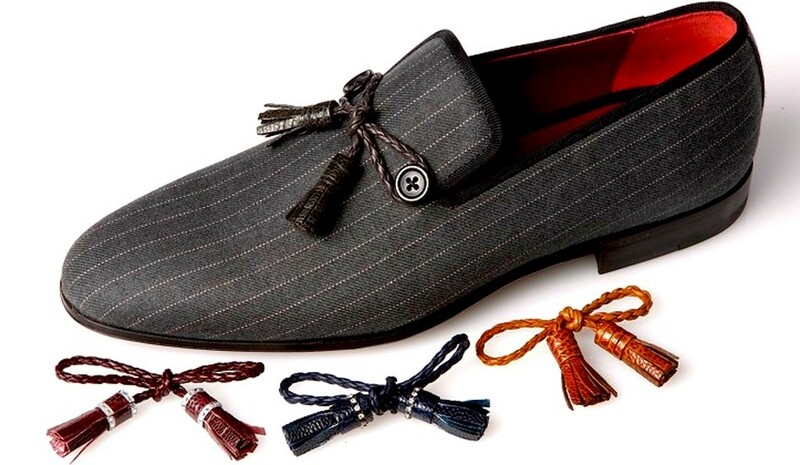 The idea of a wholecut loafer with these buttons and then an interchangeable tassel is simply brilliant in my opinion. But then adding the cloth as the upper is what makes it overkill to me. The fabric alone, as a wholecut with that lovely black trim would be great, but having it all together is not…..Far better would be having the upper in a nice lovely suede, with a contrasting leather tassel….now that would be something to drool over. But I still applaud Magnanni for coming up with this clever idea. There is nothing like being able to change a small detail (like your laces or these tassels) in your footwear (or outfit for that matter) that can allow you to have a bit of fun with mixing and matching…..On the notion of using cloths/fabrics in your footwear, I expect to see a bit more of that this year and into the next (within the classic brands). You can at least expect it from me, but I also have the feeling that you will also be able to expect it from others….times are changing my friends!! I’m glad you said that. My first thought was “I get it, but it’s just one novelty too many in a single shoe”. I wholeheartedly agree with you, Justin. Although on the other hand, if I had the dosh, I’d buy a pair. Your right Justin, they would look good in Suede. I cant find this sho on their website. I think it is amazing, and I want it. Paul – I probably would too! Don – definitely in suede!